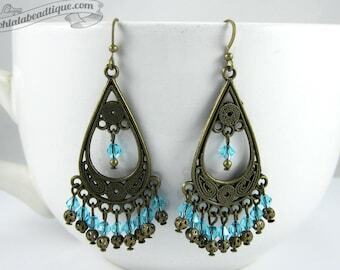 Accentuate your style with these Turquoise Chandelier Earrings. Fashioned in Tibet silver, this captivating pair boasts mesmerizing charm. Wear them with your favorite outfit and grab everyone’s attention. Turquoise Magnesite beads, and Tibet silver are combined together for a stylish look. The earrings are strung onto silver plated wire for strength, durability and drape. 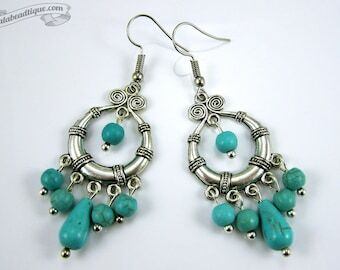 Turquoise Chandelier Earrings are approximately 2.5 inches long including the hooks. Magnesite is thought to have a calming and relaxing effect. It brings resilience and patience as well as promoting a positive attitude towards life. It assists in awakening the mind to communication from the heart. It may be due to the high magnesium content that Magnesite is said to aid both the emotional and physical bodies in “relaxing and releasing” stored tension or stagnation. Magnesite is a birthstone for the Zodiac sign of Aquarius. Many Ooh-la-la Beadtique handmade products are crafted using natural components such as semiprecious stones, freshwater pearls, and wood. No two materials in nature are alike. 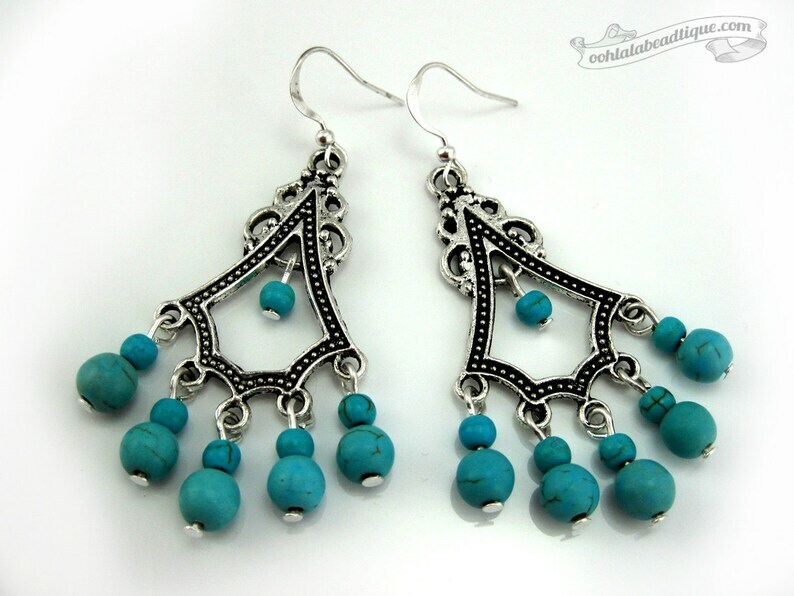 The handmade Turquoise Chandelier Earrings that you will receive may slightly vary in shade and texture pattern from the picture listing. Also note, that all monitors and computer screens are calibrated differently. The same product may appear in diverse colors on different monitors. Love the earrings I purchased! Oohlala Beadtique shipped them immediately and was very helpful in providing information to track them.